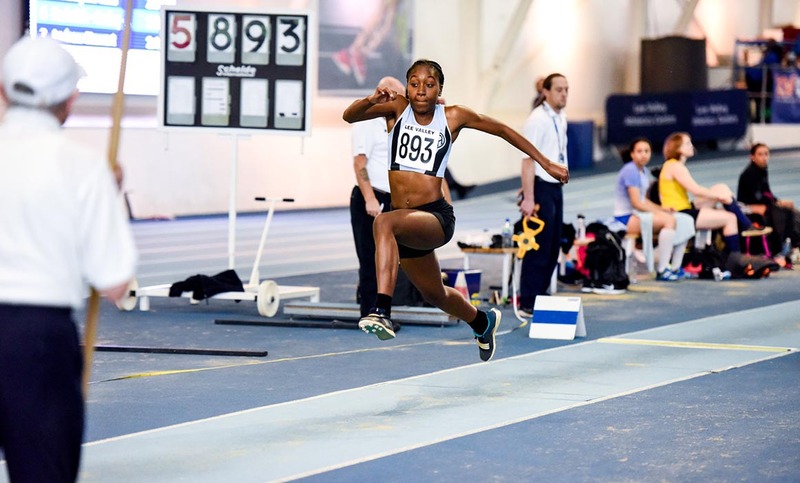 MSc Sport, Exercise and Physical Activity for Special Populations student Lia Stephenson has won a gold medal in the triple jump at the British Universities and Colleges Sport Nationals 2018. Lia out-jumped the competition at the indoor event in Sheffield, also beating her own furthest distance this season with a phenomenal jump of 12.54 metres. After training hard to overcome a lingering ankle injury, Lia is delighted with her performance and the resulting gold medal. “I am overwhelmed with joy to be crowned BUCS indoor women’s triple jump 2018 champion,” she said. Lia is grateful to Middlesex for the support she has received while studying, especially from Head of Sport and Recreation Mel Parker and his team. She was also awarded a Sports Scholarship, which has helped her pay for training and competition expenses. Training for athletic competition while studying is never easy, but Lia says her course played a part in enhancing her performance too. Lia dreams of jumping even further and joining the British Olympic team in future.